The other day I was making my first lasertag lens unit. Trying to get it focused I quickly decided naffing about with a battery and button wired straight to the emitter wasn't good enough. Plus I burned out one emitter keeping it on too long. 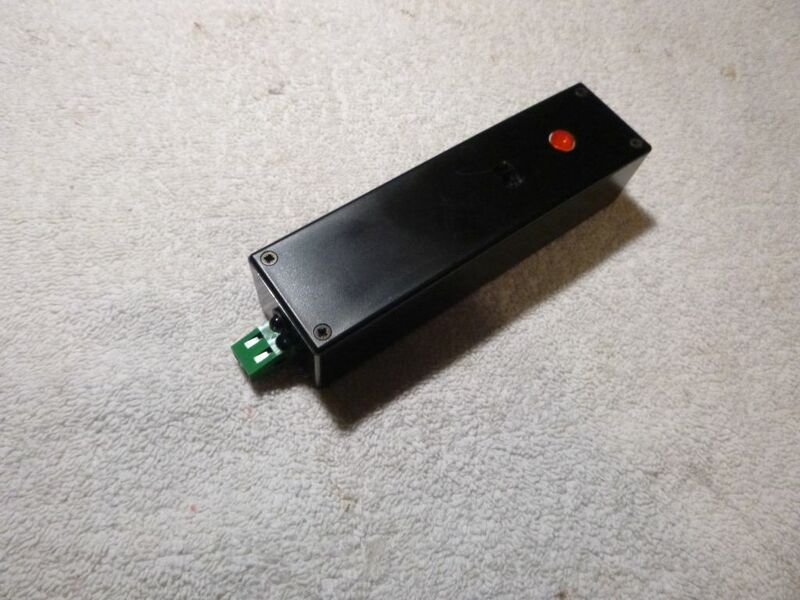 So I built the essence of a lasertag gun in a box, with screw terminals to make it easy to connect up to things for testing. It's also got a low power unlensed emitter run in parallel, in case you want to test sensors. I've left the USB connector of the Arduino Nano accessible at one end so it can be reprogrammed easily as for now it's just sending WoW hits. I may open it up again and put screw contacts for the trigger so it can be used as a general purpose thing to tag up bigger props on an ad-hoc basis. It's got 4 AAA NiMH batteries in so with a decent lens unit will have a passable range. If there's space, which I doubt, I may stick in an IR sensor so it could also be a thing that registers hits, making it a multi-use device for props.